Hamantaschen can be made with yeast dough, a sour cream dough, a rich short crust or biscuit pastry. I have chosen to use a rich short crust pastry. 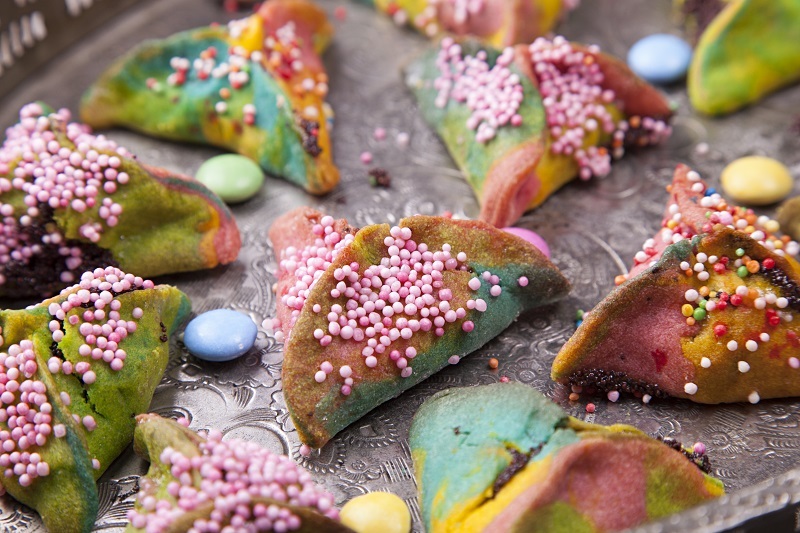 This is made using four colours of pastry, patch worked together, rolled out and then shaped into Hamantaschen. In addition to the colour, I have flavoured each colour pastry with a different flavouring ~ this is optional but certainly fun! I have given you four different types of fillings. Make these before you make the pastry as they need to be cool before using. NB: The quantity of pastry is quite substantial – it does work using half! Add the sultanas, cinnamon, chopped walnuts, sugar, and butter to the food processor and pulse gently to combine. Make the apricot filling by combining all the ingredients together in a saucepan. Stir and bring to the boil, lower the heat and simmer covered for 10 minutes. When there is about 1 tablespoon of liquid left, transfer to the liquidiser or food processor. Remove and transfer to a dish. Leave to cool and then leave in the fridge until ready to use. It is easier to use when it is completely cold. Use 1 teaspoon of Nutella in the middle of each hamantaschen. Finely grind poppy seeds in spice mill. Transfer to a medium saucepan and add honey, milk, lemon juice, sugar, and salt. Bring to a boil, reduce heat, and simmer, stirring often, until thickened and a spatula holds a trail when dragged across bottom of pan, about 4 minutes; stir in vanilla. Let cool. Pre-heat the oven to 400ºC/200ºF/ Gas mark 6. Make the pastry by mixing all the ingredients together in a food processor. Divide the pastry into 4 portions. Wrap each pastry batch in cling film and flatten. Leave to rest for 30 minutes. 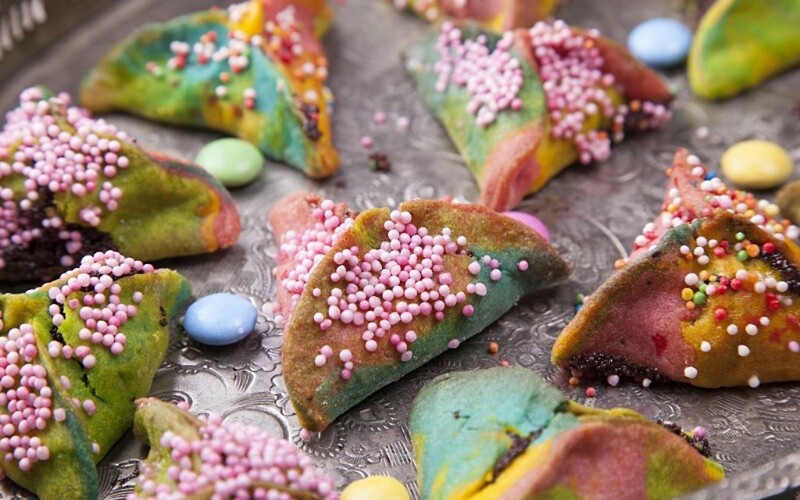 To make rainbow hamantaschen, roll out the coloured pastry taking a little of each colour dough and roll so it is about 2cm thick. ~ a patchwork effect is what you want to make. Using a 7.5 cm (3 inch) cutter make round templates. Repeat with the remaining pastry. Now add a large tea spoonful of your choice of filling into each circle. Draw up the sides to form a triangle, pinching the edges firmly together in the shape of a tricorn hat. Transfer the Hamantschen to the baking tray and bake for 20 minutes. Remove and leave to cool for 5 minutes. Glaze with egg white and then sprinkle with poppy seeds and hundreds and thousands for a magnificent finale. To serve the stylish way: Dust with icing sugar.